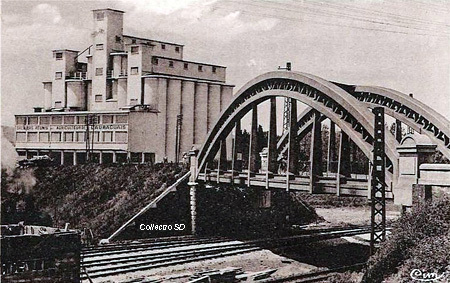 The Station site, shown in the immediately adjacent older postcard view, is still accessible and the lower part of the water tower remains in place. The site ius now in use by the municipal authorities as a technical training centre. 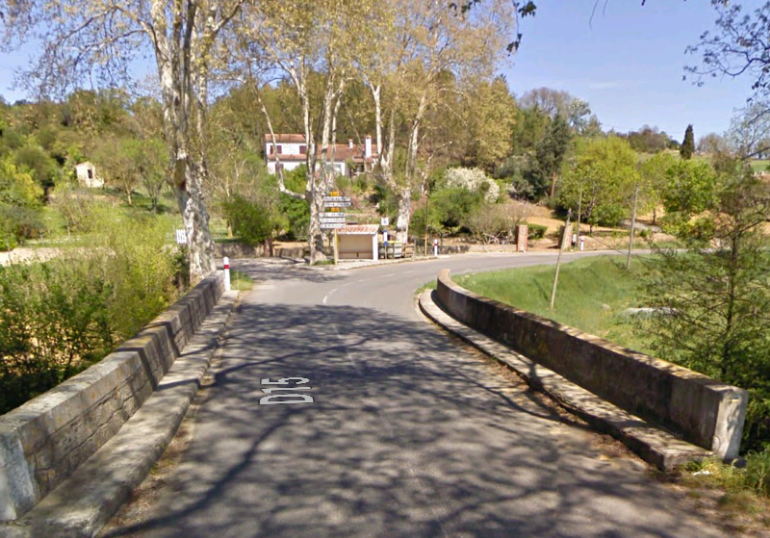 Turning to face northeast, the tramway formation can be seen on the right of the road dropping down to join the road as it crosses the bridge over the River l’Hers Mort and then bearing away to the right to head for Castelnaudary. 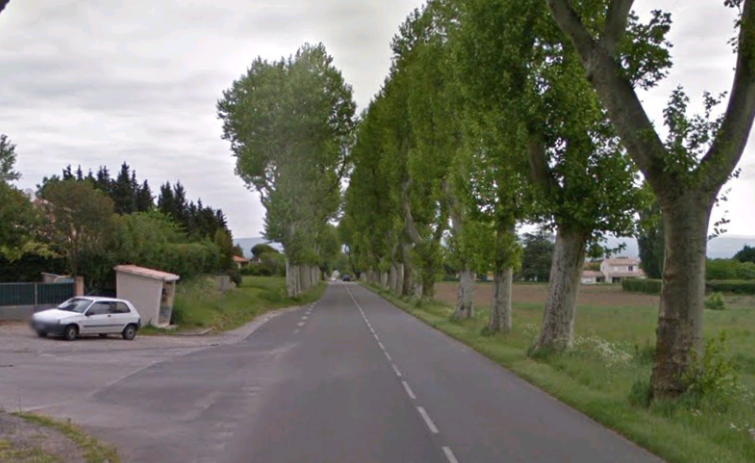 Both these next two images are taken from Google Street view. 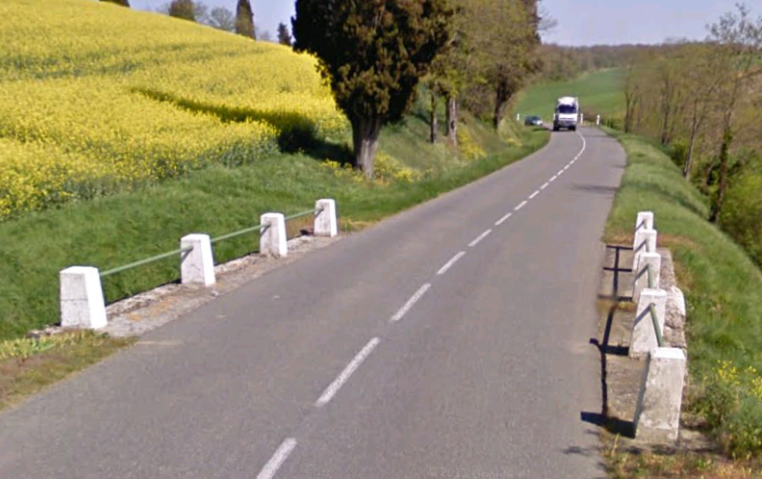 After the bridge the D15 follows the bank of the river for about 2.5 kilometres. The old tramway route was to the southwest of the road, between it and the river. The formation of the modern road has swallowed up any remnants of the tramway. 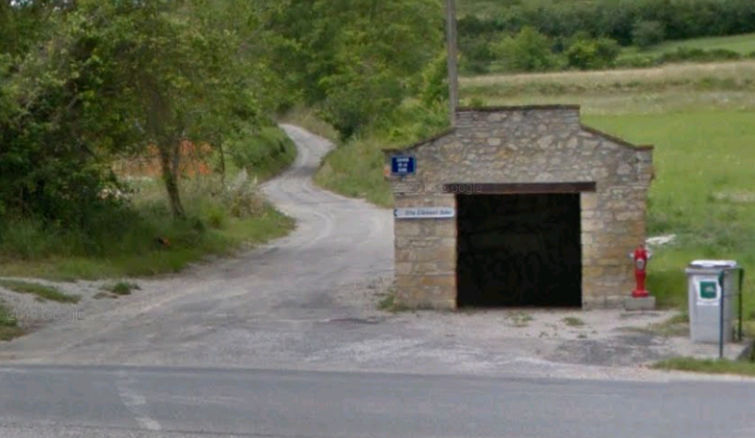 A halt at Saint-Andre was followed by another at Nadal close to the crossroads with the D624. 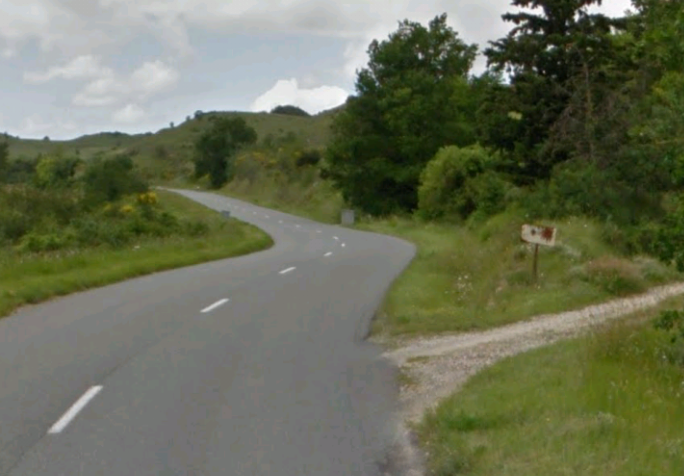 Here the tramway turned left to follow the D624 into Montauriol. 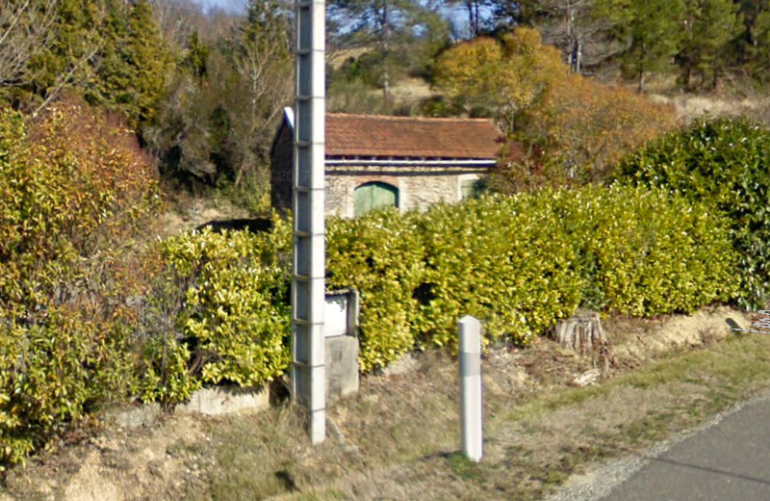 Theree was a level-crossing across what is now the IC15 (D15) before the tramway followed the north side of the GC19 (D624) towards Montauriol. 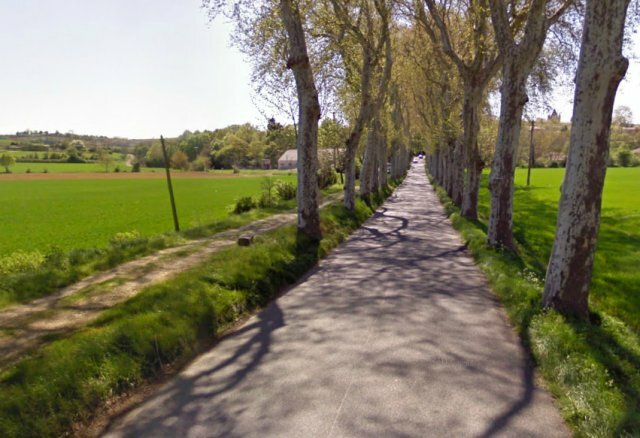 There is no sign of the tramway in evidence until the cross-roads at Montauriol are reached. At this point, hiding behind a modern hedge, the station building can still be found. 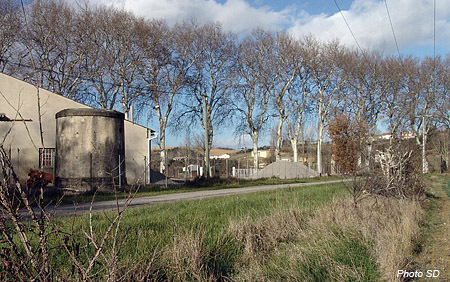 The village of Mantauriol is to the south of the road and tramway. The old station building can be seen tight in the top right corner of the satellite image with the village son way south down the D17. 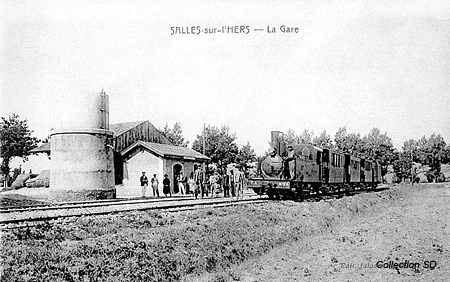 The station at Montauriol was small and the goods facilities were accessed as elsewhere on the line by using a turntable. Passenger facilities were space. 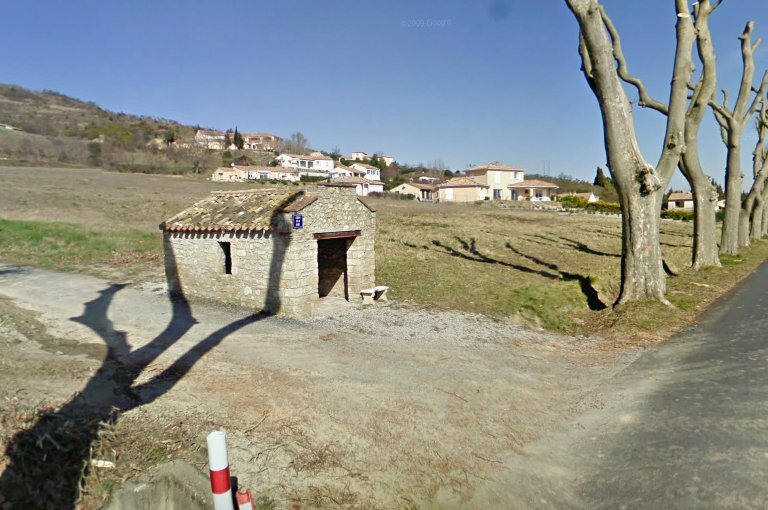 The next halt/station on the route was Cumies-Payra, again there is no sign of the tramway on the ground between Montauriol and Cumies-Payra. The next limited evidence is at Cumies-Payra where the station location remains but as an open bus/lorry/car park. 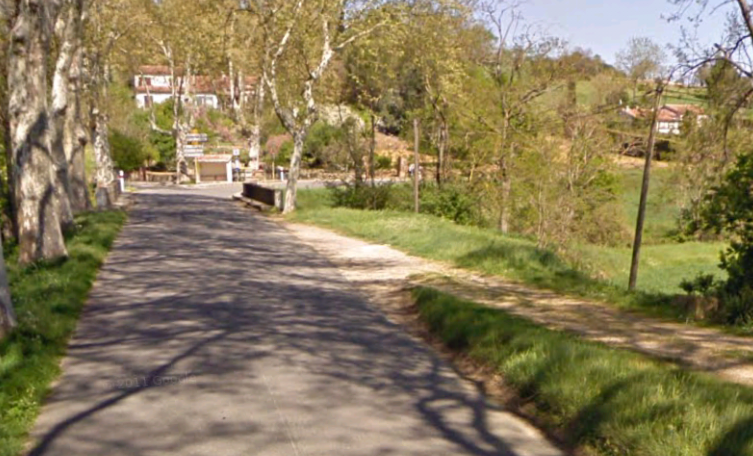 The Google Street view image below shows the location. The adjacent sketch plan needs rotating through 90° to match the above picture. The through line ran roadside with the ticket office towards the rear of the image. A turntable provided access from the mainline to two sidings, one of which was provided with a raised unloading platform. The station at Cumies-Payra is situated midway between the two villages. 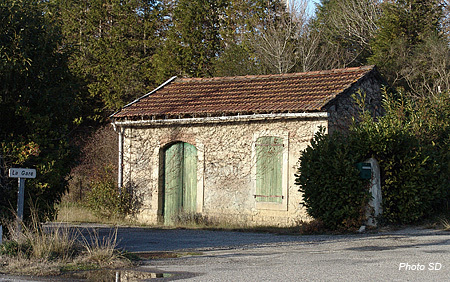 Payra-sur-l’Hers has a population of around 150 in the early years of the 21st Century. Cumies has a population of around 35 now-a-days. Payra-sur-l’Hers was to the south of the tramway and Cumies to the north. In the 21st Century, they are linked by the D517 which crosses the D624 (the old GC19) and the tramway next to the station site. Trams continued from Cumies-Payra towards Castelnaudary and arrived at Villeneuve-la-Comptal via Borde-Neuve and Fontcontar. There are no signs along the road of the presence of the old tramway. The old formation will have been subsumed under the present wider road carriageway. Even the bridges show no sign of the tranway’s existence. North of Borde-Neuve the tramway route separated from the road to give it a better, gentler gradient. 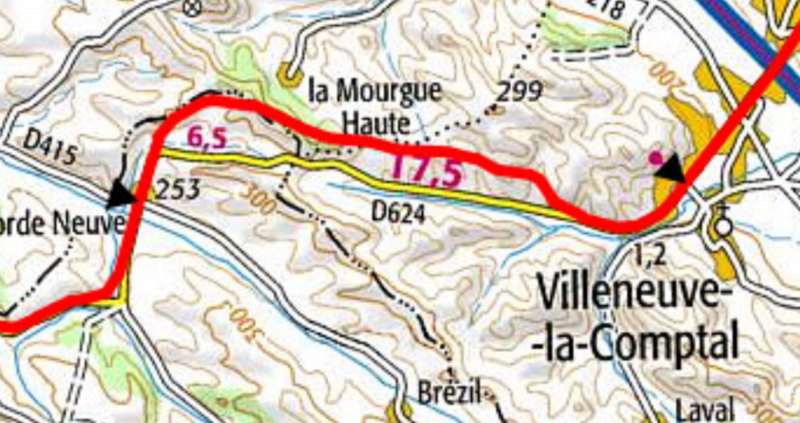 One website suggests that the line of then deviation was as marked below. There is no evidence at the bend in the D624 of the divergence of the tramway, as can be seen in the image below. 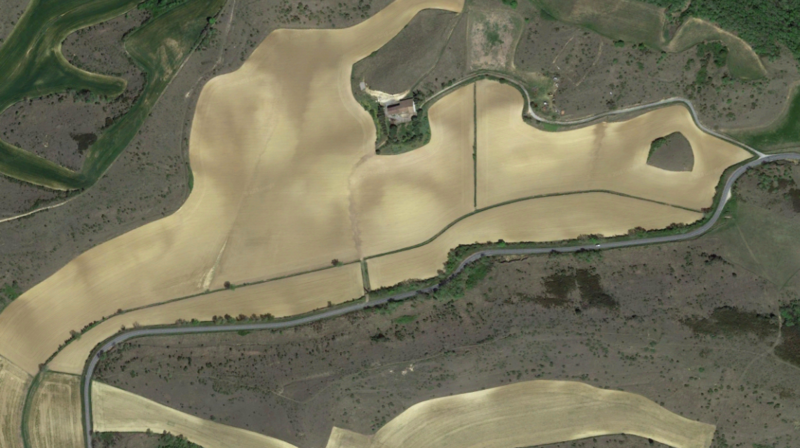 Nor is it possible to pick out the tramway route in the satellite image over the first field north of the D624. 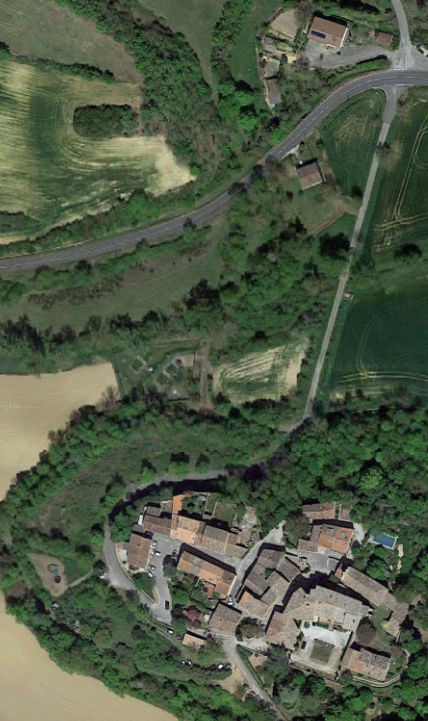 Itbis, however possible that the tramway could have followed the farmtrack shown to the east of the satellite image below. If this were to have been the case, the building(s) at the centre-top of the image would have marked the point at which the tramway route could be identified on the ground. 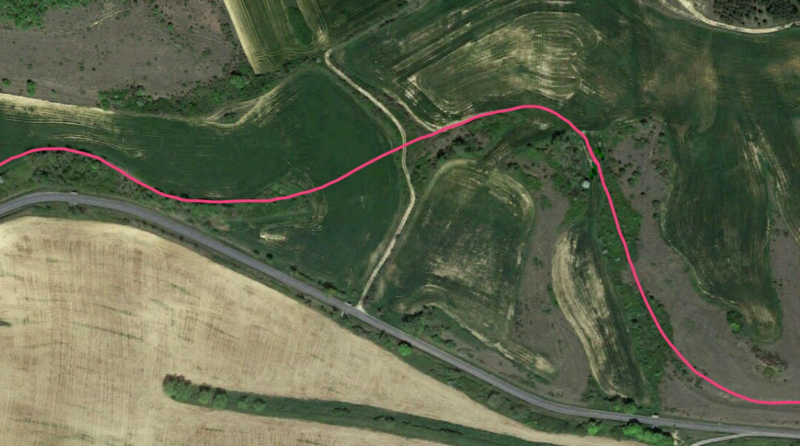 Trams would have followed the first part of the farm track back towards the present D624 and then travelled north of that farm track on the hillside. That route is, however, once again, very difficult to pick out. An alternative much shorter derivation is shown on the Michelin map of the time. I am much more inclined to credit this shorter deviation as being the actual route of the tramway. 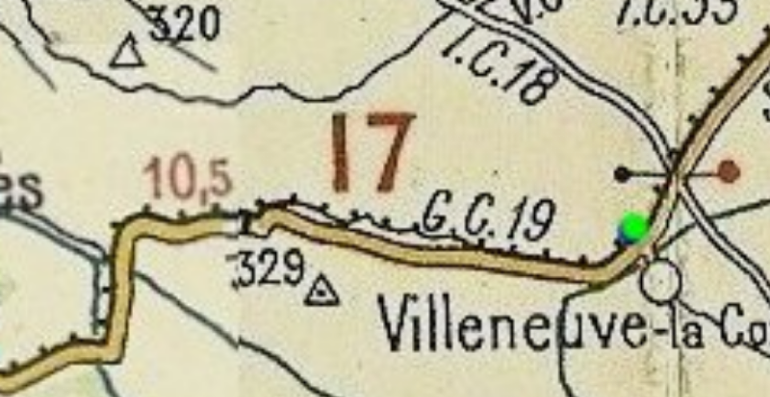 The extract from the Michelin map shiws the tramway on the north side of the GC19 for some distance from Borde-neuve until the point just above the ‘3’ of the height marker, 329 m. The road and tramway alignments are then close but separate for a distance. 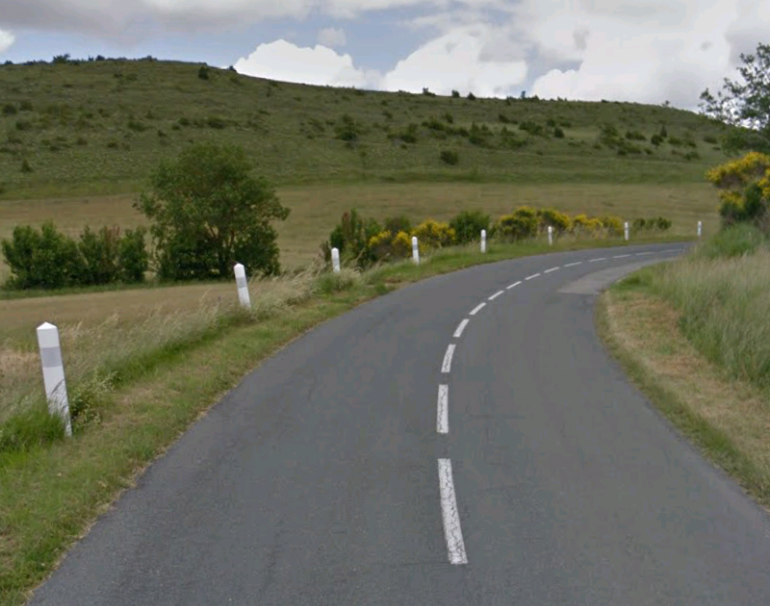 The deviation from the route of the road was designed to avoid one steep section of gradient on the road. 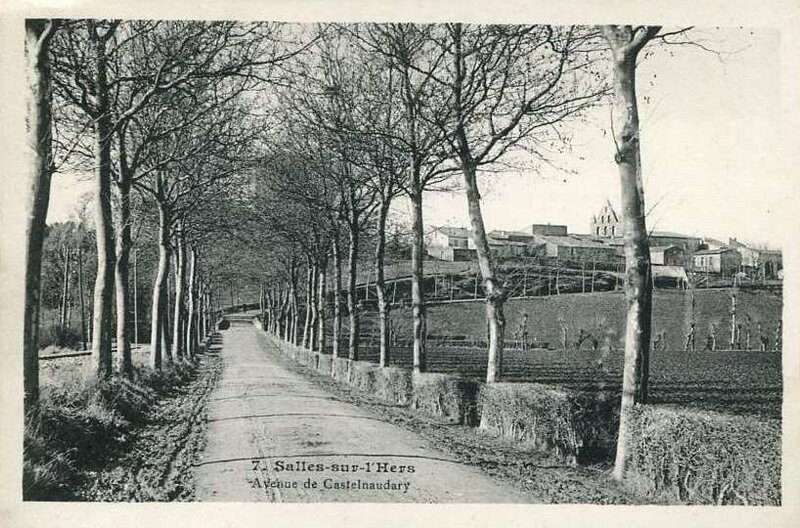 At its height, the tramway reached 293m above sea-level, at Villeneuve it had dropped to 164m above sea-level. This shorter deviation has much more to support it and there is evidence available in satellite images which support the Michelin mapping. Careful examination of the above image will show remnants of the tramway alignment running from the present-day track on the left, just a few metres to the north of the road and then running to the north of the copse of trees at the right hand side of the picture. This next section of the deviation is more difficult to pick out. I have provided an approximate alignment which is suggested both by contours and topography. This final length of the deviation does not need marking, the tramway route wanders sinuously around on the north side of the modern road. 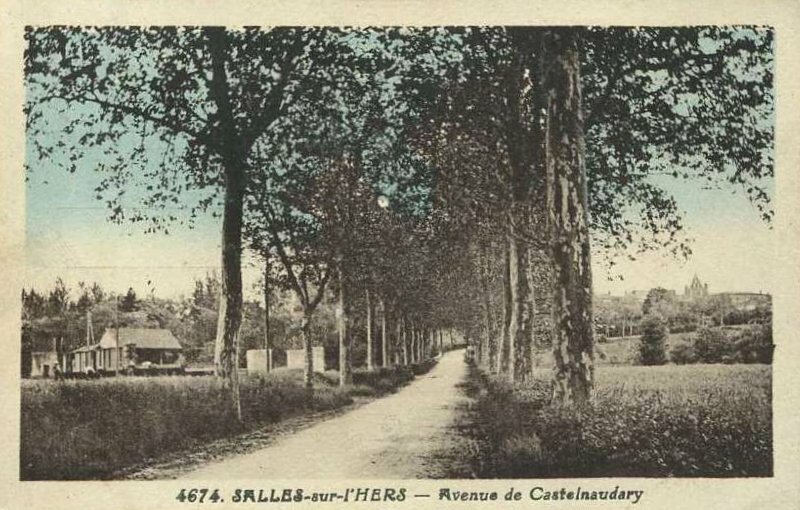 The tramway continued to follow the northwest side of the GC19 (D624) into Castelnaudary, through what are now the suburbs of the town which reach all the way to Villeneuve. 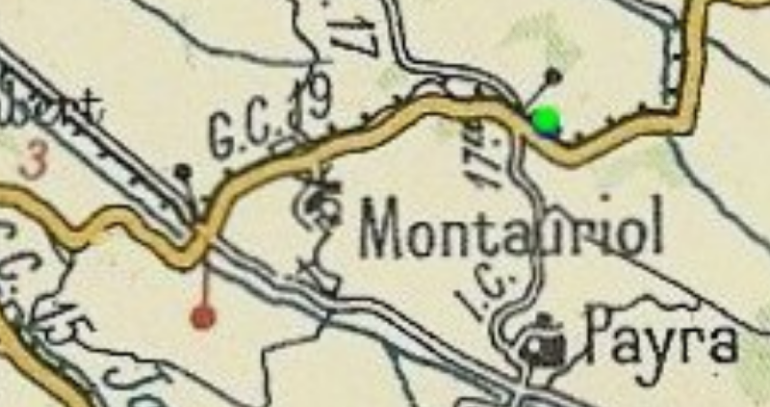 The old Michelin map shows the station on the south side of the town and is additionally marked by a green dot. 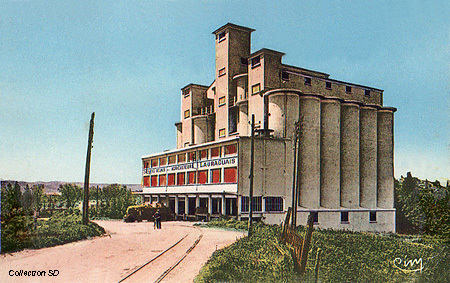 Before reaching the station the trams passed a large complex of grain silos. These are now owned by Arterris, a large Agricultural Co-operative. The buildings dominate the southern half of the town – a veritable cathedral of the agricultural industry which dominated the region. Immediately beyond the silos the tramway crossed the Compagnie du Midi main railway line between Bordeaux and Were. 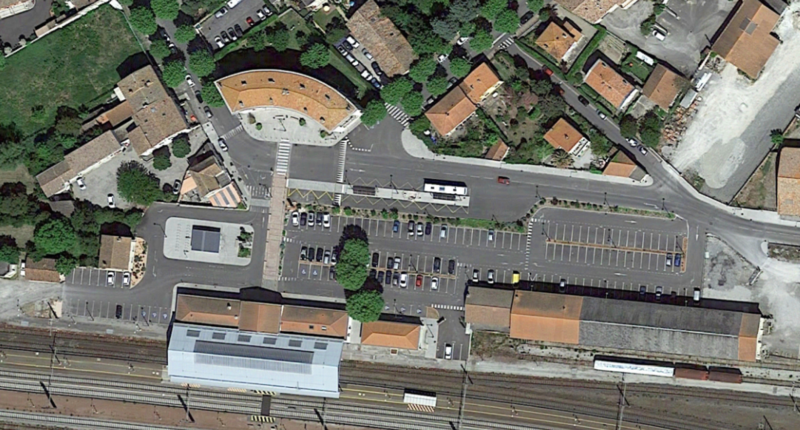 The Tramways de l’Aude Station shared a location with the Compagnie de Midi Mainline Station. The original approach for trams took them at level across the mainline, but with time this clearly became unsatisfactory. The tramway and road were diverted and a bridge was provided across the mainline of the Compagnie de Midi. 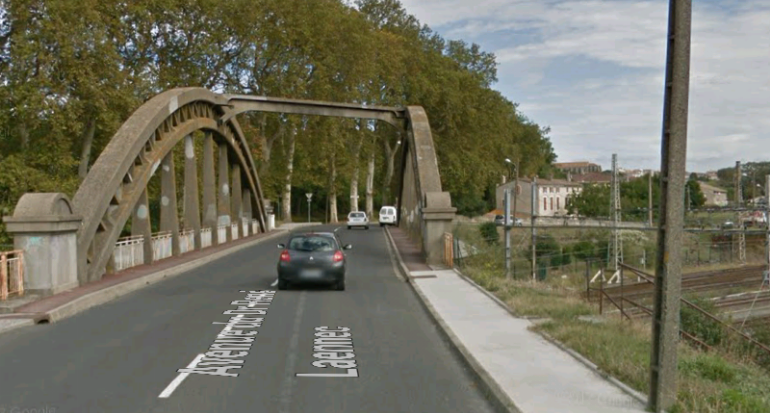 The approach to Castelnaudary was across this bridge. This Google Street view image is taken from a point adjacent to the grain silos above. The Tramways de l’Aude shared the station forecourt with the Compagnie du Midi and a few photographs of their station follow before the post concludes with some timetables for the tramway. 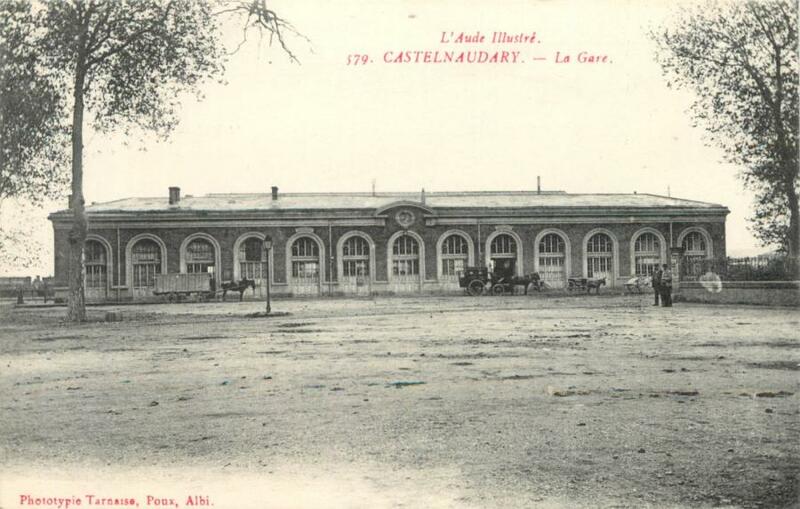 The original station frontage of La Gare due Midi. 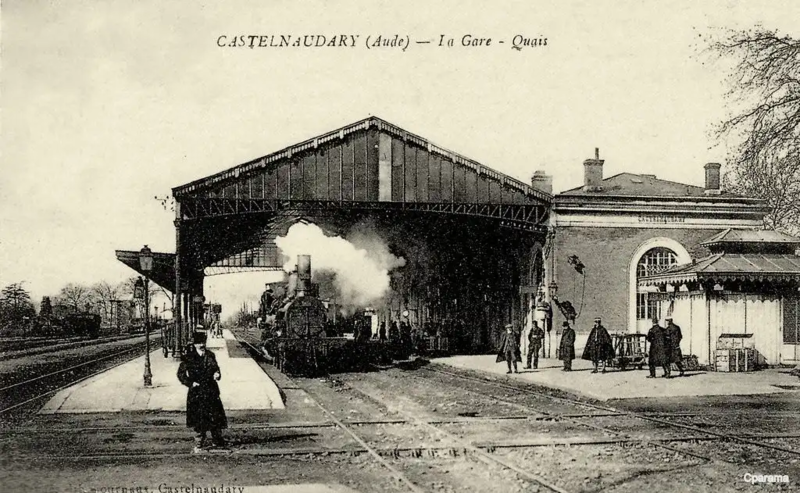 Two views of the trainshed at Castelnaudary in the early years. 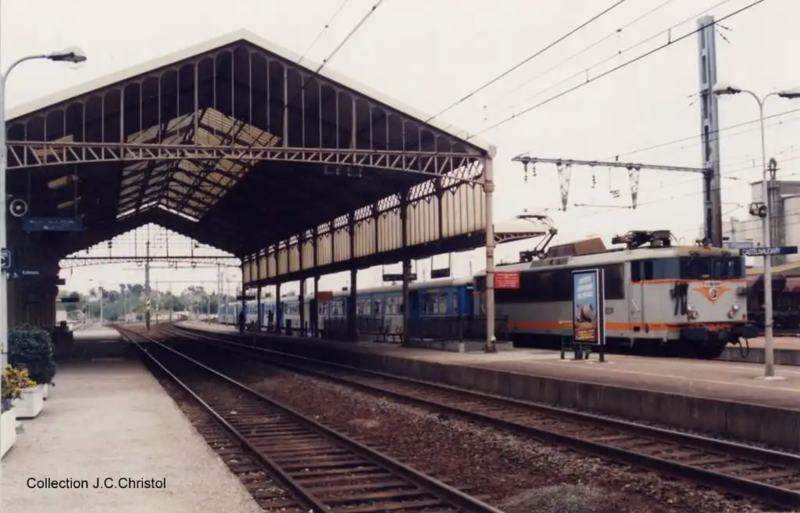 Castelnaudary Station in 1997, © J.C. Christol. Castelnaudary Station forecourt in the 21st Century. Castelnaudary Station forecourt in the 21st Century. 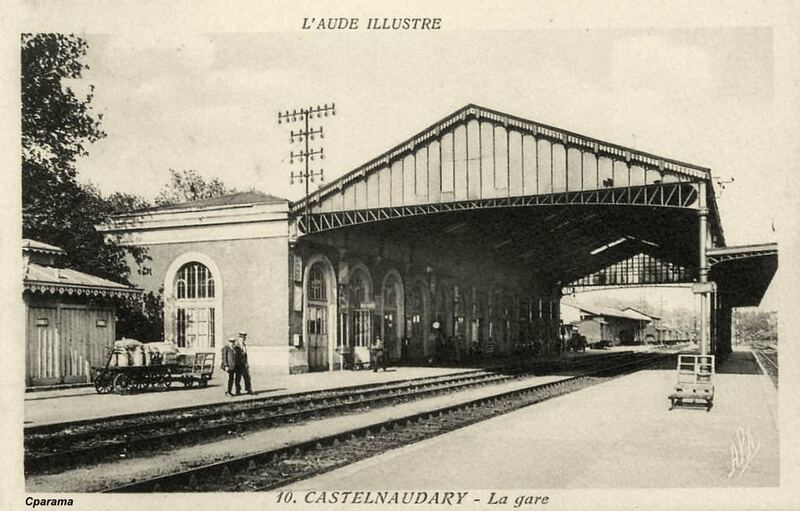 The train-shed of La Gare due Midi is easily seen at the bottom of the image. 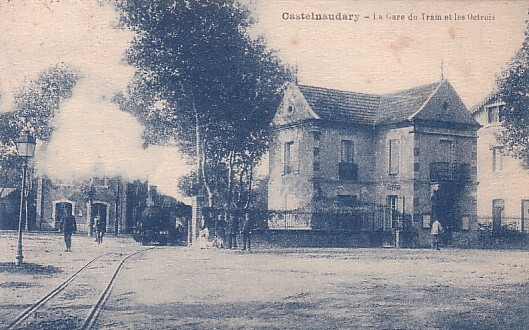 The station building for the Tramways de l’Aude is the square building to the bottom left of the picture. 1. http://sgdelestaing.pagesperso-orange.fr/Francais/Tramway4.htm#Epilogue, accessed on 27th August 2018. 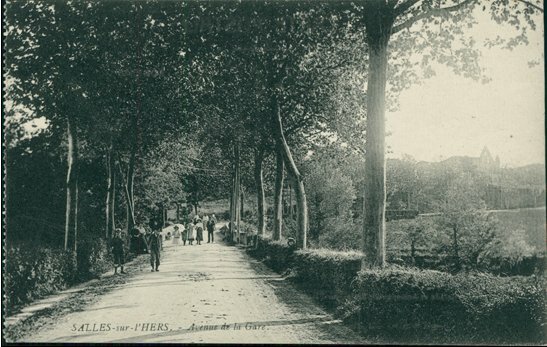 2. http://chemins.de.traverses.free.fr/Tramway_Aude/Gare_Salles_Hers.htm, accessed on 29th August 2018. 3. http://chemins.de.traverses.free.fr/Tramway_Aude/Index.htm, accessed on 1st September 2018. 4. http://chemins.de.traverses.free.fr/04533299f60f7f819/0453329a010d0be29.html, accessed on 1st September 2018. 5. http://chemins.de.traverses.free.fr/Tramway_Aude/Gare%20Villeneuve.htm, accessed on 2nd September 2018. 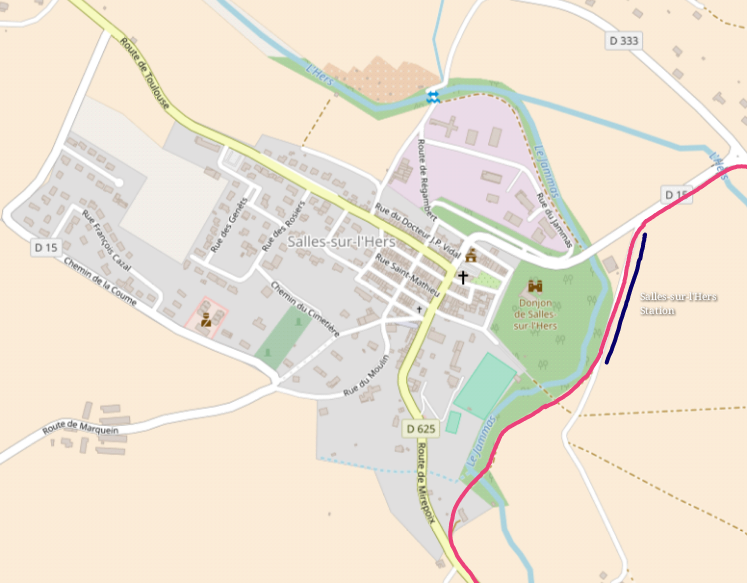 6. http://sgdelestaing.pagesperso-orange.fr/Francais/Tramway.htm, accessed on 29th August 2018. 7. http://chemins.de.traverses.free.fr/Tramway_Aude/Gare_Castelnaudary.htm, accessed on 2nd September 2018. 8. https://www.arterris.fr, accessed on 2nd September 2018. 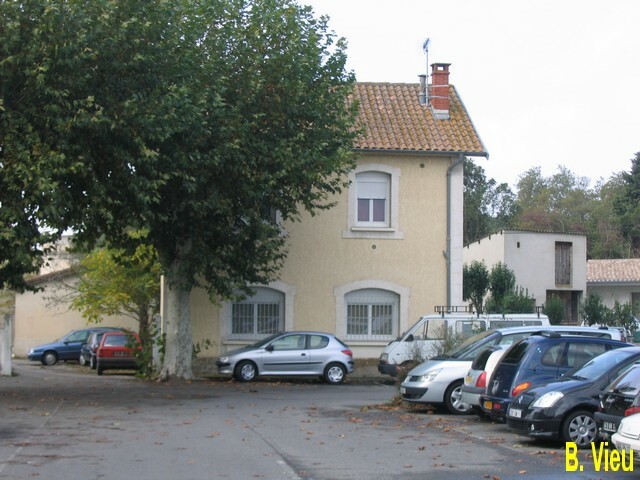 9. https://fr.m.wikipedia.org/wiki/Gare_de_Castelnaudary, accessed on 2nd September 2018. 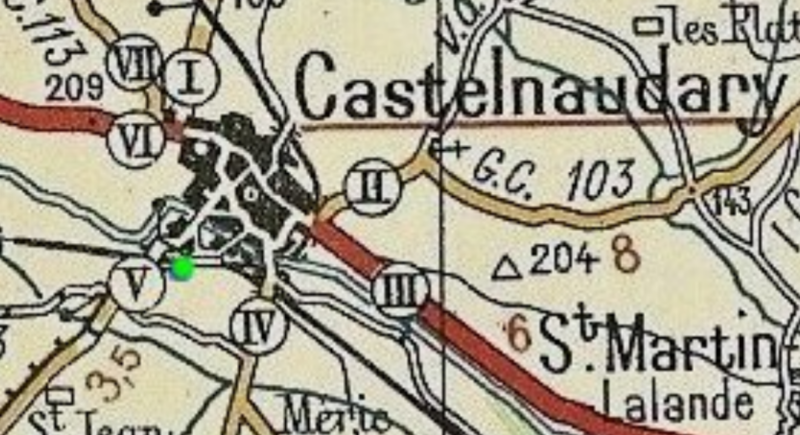 10. https://www.cparama.com/forum/castelnaudaey-aude-t24642.html, accessed on 1st September 2018. This entry was posted in Railways and Tramways of South-Western France, Railways Blog on September 2, 2018 by rogerfarnworth.